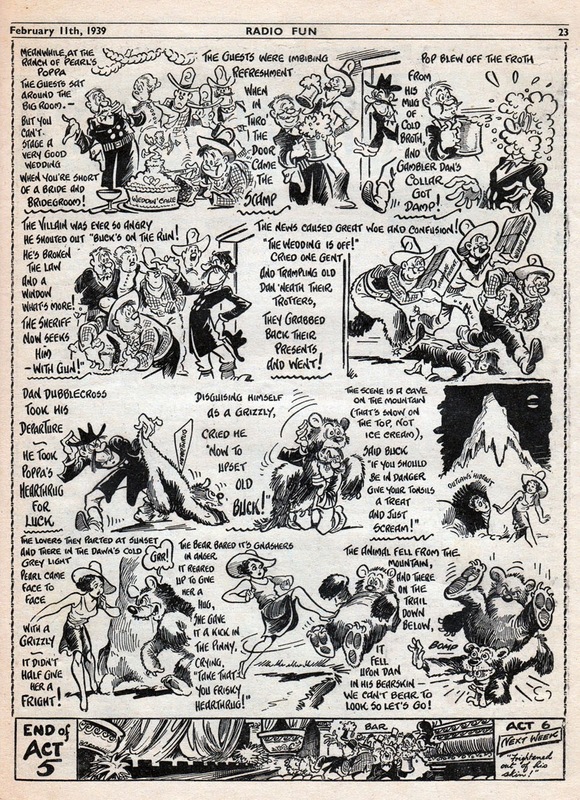 Comics often have various revamps and new looks over their long runs, and Radio Fun was certainly no exception. Yet it's first revamp came just a few weeks into its 23 year run. When Radio Fun was launched in 1938 its cover star was George the Jolly Gee-Gee, drawn by Amalgamated Press' top humourist Roy Wilson. Presumably George was on the cover because Radio Fun's rivals Dandy and Beano had animal characters on their covers. 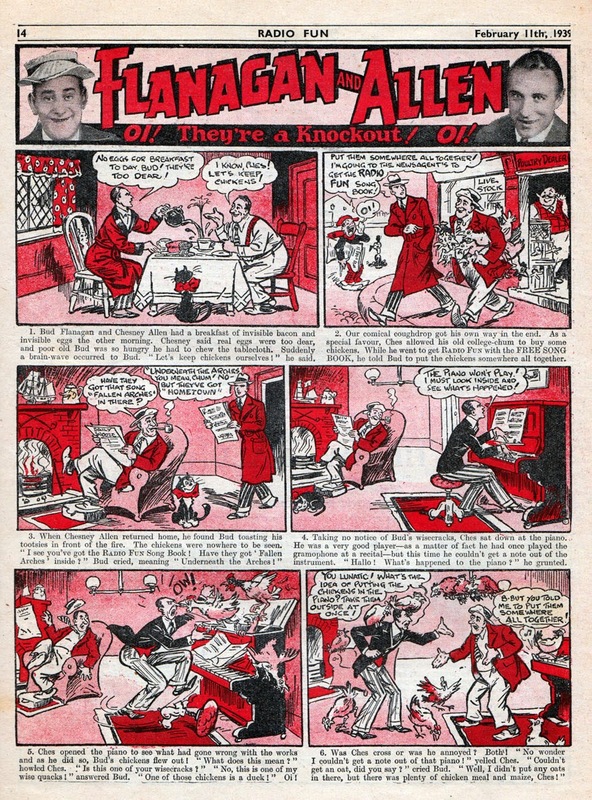 However, it seems editor Stanley Gooch soon had misgivings about this, thinking that a comic called Radio Fun ought to have something connected with radio on the front page. 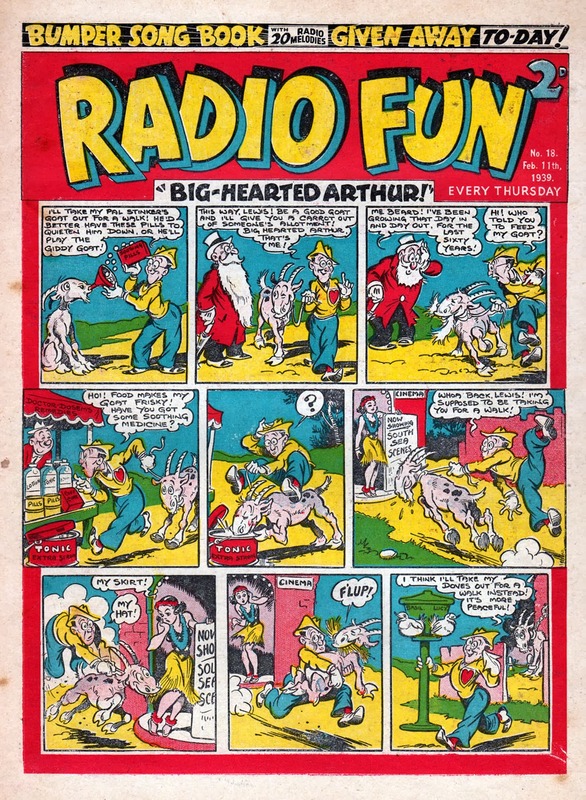 Therefore, with issue 18, dated February 11th 1939, Radio Fun had a mini-revamp, with a new logo, a free gift, and a new cover star, - Big Hearted Arthur, drawn by Reg Parlett. 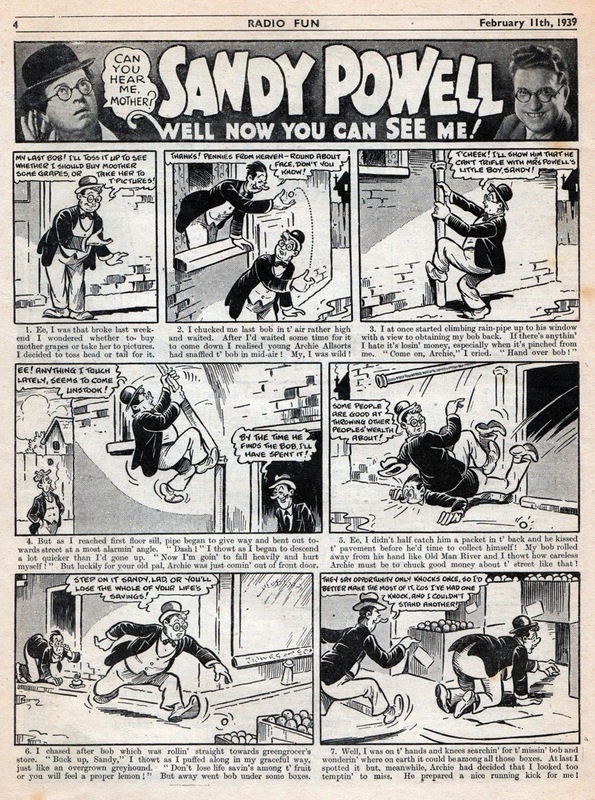 The character was of course Arthur Askey, who had previously had a strip inside the comic, but Arthur was very popular in 1939 and deserved his cover slot. Inside the 28 page comic, the set-up had a few tweaks. George the Jolly Gee-Gee was relegated to a black and white half pager. I'm not even sure if this one was drawn by Roy Wilson as it's not up to his usual standard, but perhaps the sudden switch to a different format had required it to be drawn quickly. 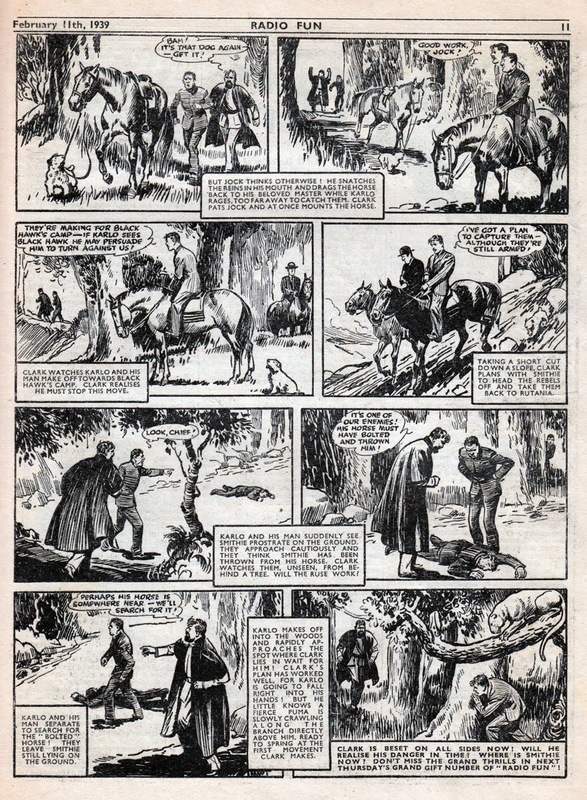 The rest of the comic carried on unchanged, with its mixture of prose stories and comic strips. Despite its title, Radio Fun never limited itself solely to radio stars. 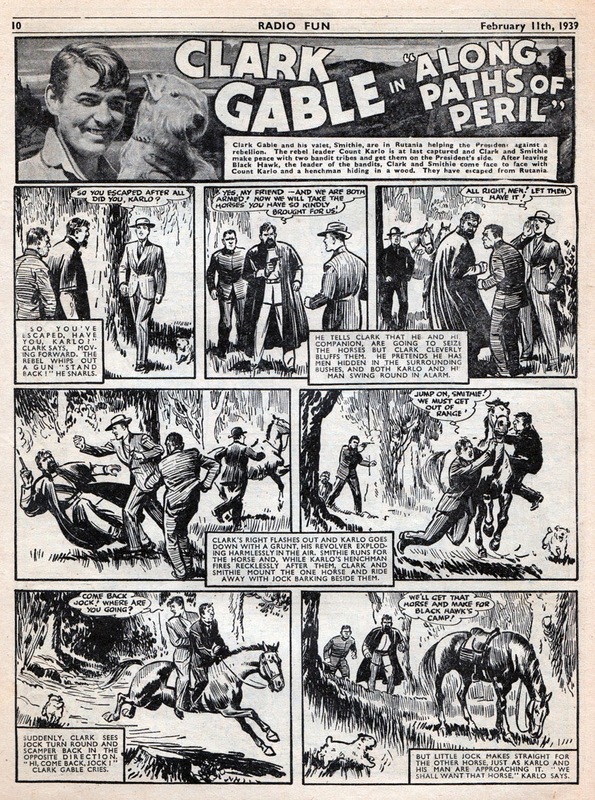 Here's Clark Gable in the latest installment of Along Paths of Peril drawn by George Heath. Another big UK star of the time was Sandy Powell. Like many performers of the time he'd begun his career in the music halls. By the 1930s his radio career was underway, and his catchphrase "Can you hear me, mother?" became famous across the land. (Some people still use it today!) 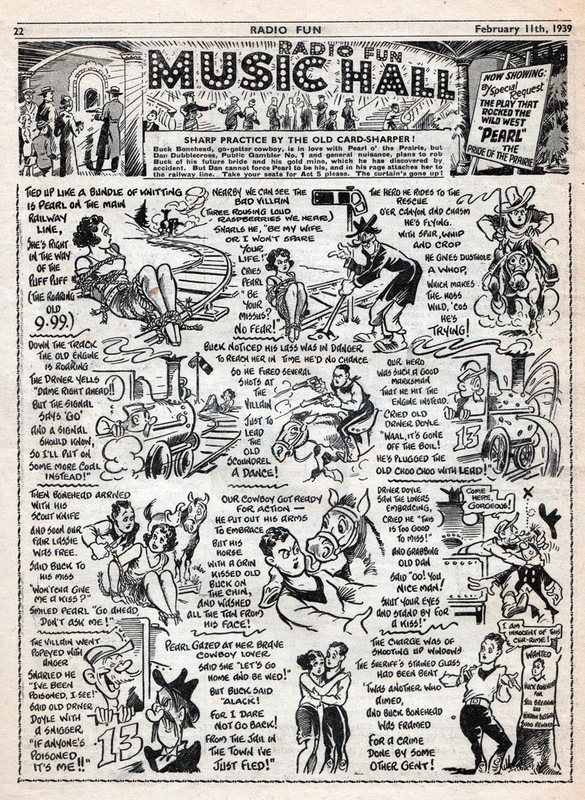 The comic strip in Radio Fun was drawn by George Parlett, brother of cover artist Reg. 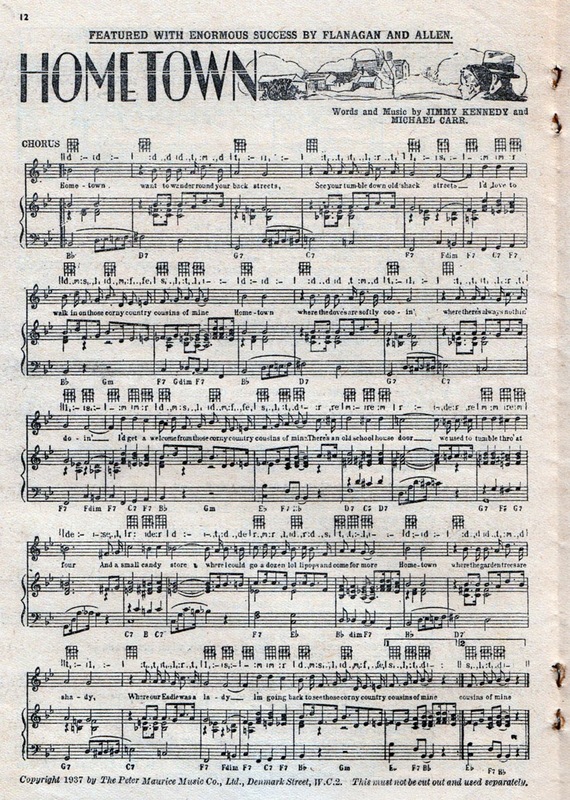 George Parlett also illustrated the two page Radio Fun Music Hall serial. I know I've shown one of these on this blog before but it's such a great strip it's worth showing another. 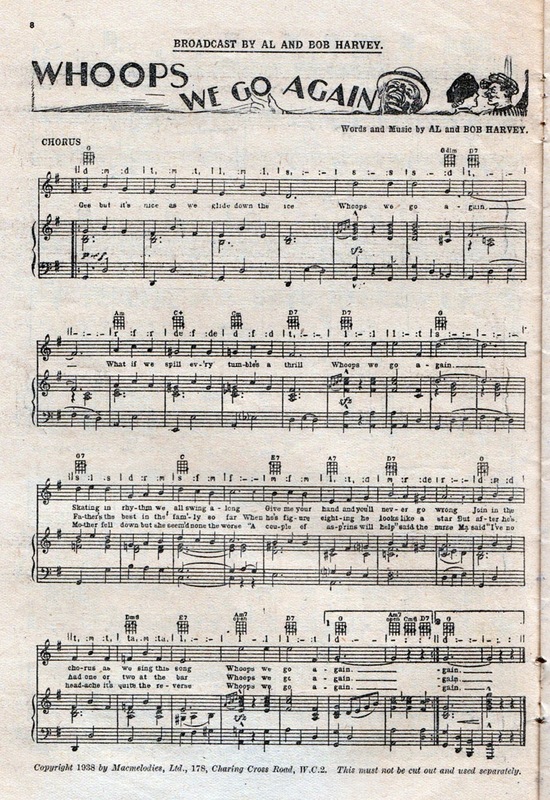 The layout of the pages, mixing art and rhyme, are quite unique and ahead of their time. I mentioned that this issue contained a free gift. 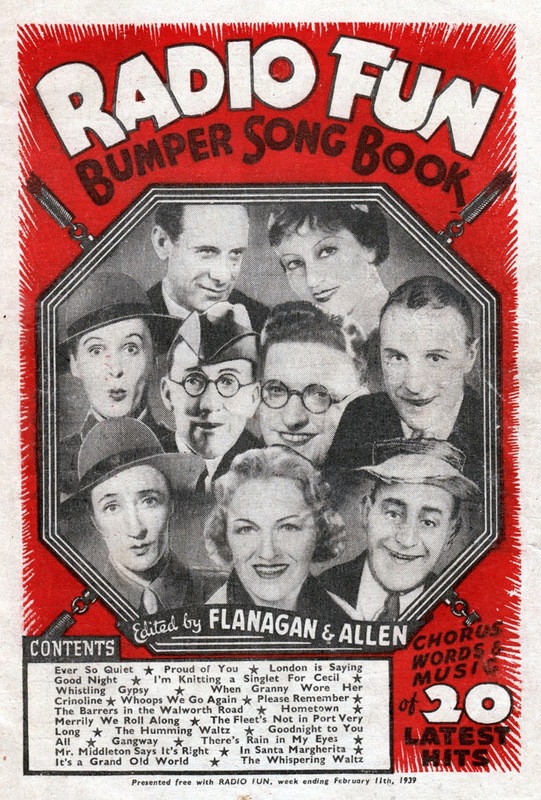 Here it is, - the Radio Fun Bumper Song Book; a 28 page giveaway featuring the sheet music to "20 latest hits" such as London is Saying Good Night, I'm Knitting a Singlet for Cecil, and When Granny Wore Her Crinoline. 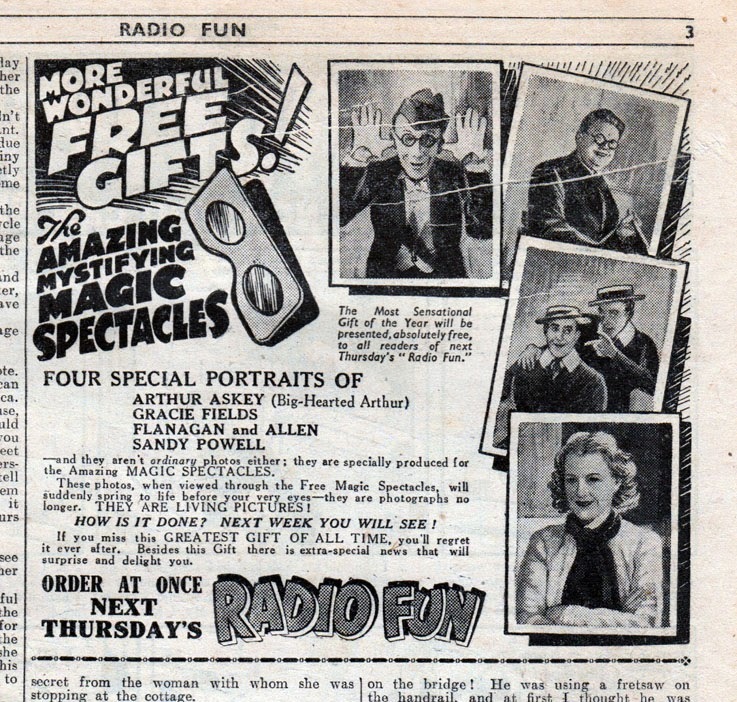 There was also a free gift scheduled for the following week in the form of 'Magic Spectacles' and 'Living Pictures' that "spring to life before your eyes". I'm assuming they were an early form of 3-D specs. 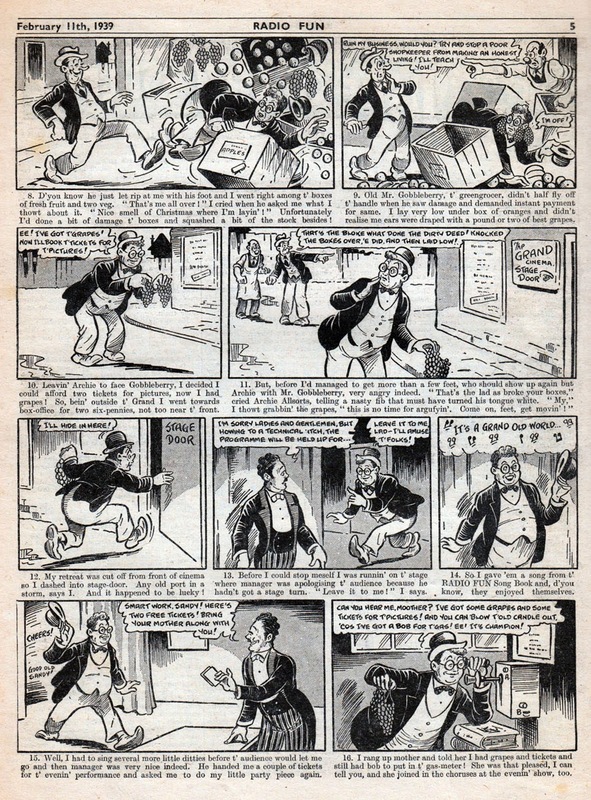 Radio Fun was a worthy rival to DC Thomson's comics. I have a good selection of issues from over the years and I think if I'd been around back then it would definitely have been one comic I'd have plonked down my 2d every week for. Now Radio fun was a comic that told you what it was. Strips about Famous people were very common and they didn't just introduce them as favours of the month..
one thing I've noticed though.. There should have been, but I've never noticed George Formby. of course, another thing I've wondered was.. Were any of the people used WITH permission? 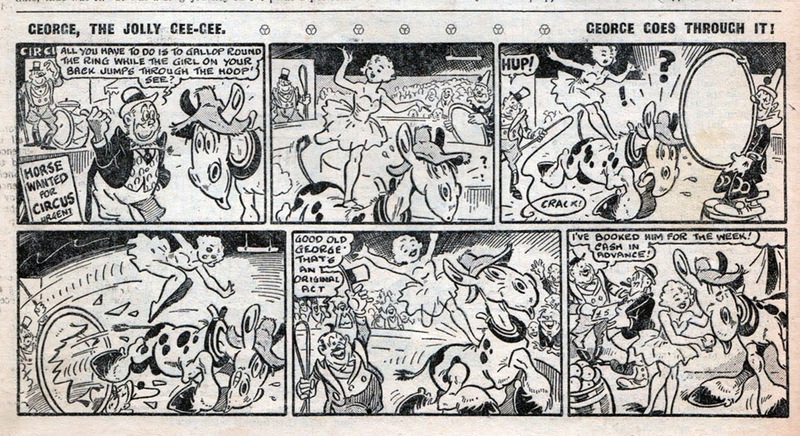 There was a George Formby strip in AP's other celebrity title, Film Fun. I'm sure most of the stars were aware of the strips they featured in, but in those days the editor didn't have to check for clearance first. Sales were so good on comics back then that I'm sure most of the celebrities saw it as free publicity. I forgot all about the Film fun strips ^_^ silly me. Never heard Arthur Askey's show, but on a site that streams British radio comedy I heard his sidekick Richard (Stinker) Murdoch's later show, "The Men from the Ministry."